A Romantic Weekend Getaway in New Orleans! Phil and I just recently spent a great weekend in New Orleans. The first night we stayed at the Saint Louis Hotel which by the way, has great rates in off peak season. 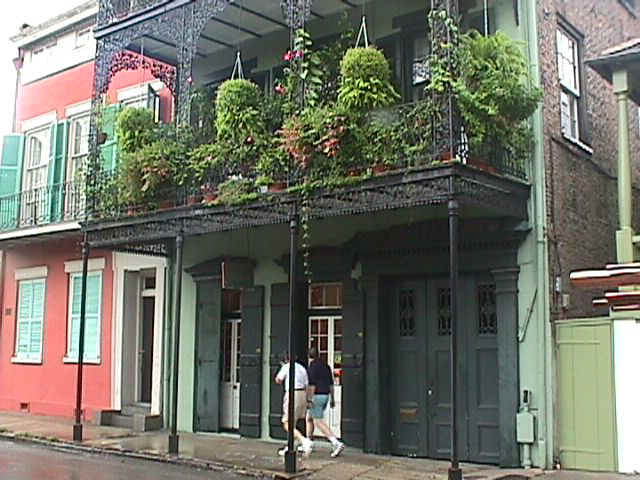 It was recently rated the number one hotel in the french quarter by Conde Nest travel magazine. The other two nights, we stayed at the Lafitte Guesthouse which is a wonderful Bed and Breakfast on Bourbon Street (the quiet end!) An old mansion that was converted to a guesthouse, with 13 different rooms, all decorated in victorian antiques and each room completely different. We highly recommend this B&B, especially for a romantic getaway. The French Quarter is very quaint in it's architecture, lot's of balconies trimmed in ornate wrought iron such as this photo above. Take a horse and carriage tour of the French Quarter, it's worth the money, and it's a great way to get a little history of the area. Our driver Clarence was a scream, that in itself was worth the ride! Of course, what would New Orleans be without a night out on Bourbon Street! We were there during the off season, I couldn't imagine what Bourbon Street would be like in Mardi Gras! We strolled the strip looking in all the little stores, stopping along the way to buy another alcoholic frozen concoction that you can take with you when you leave! No need to throw away your drink in New Orleans....just carry it right out of the bar or club and drink along the way until you get to the next place. I like that idea! As many people are walking on Bourbon Street are the people that are up on the second floors of many of the restaurants and bars hanging over the balconies waiting for women below in the street to remove their tops so they can toss down strands of beads. Needless to say, Phil enjoyed that part! We came to the conclusion that there is no such thing as a bad restaurant in New Orleans, the food is exquisite. From the casual no frills type places such as Acme Oyster Bar where they serve excellent local favorites such as jambalai and red beans and rice. Not forgetting to mention their oyster bar where a pile of oysters were laid on the bar waiting to be scooped up onto crackers. The second night we decided to check out an upscale restaurant called Bayonas which serves new American cuisine. After indulging in soup and wonderful bread, not to mention and an apetizer made of shitake mushrooms on a bed on croutons topped with goat cheese,we hardly had room for the main course! We somehow managed to force it down. We found a great place one morning as we were dogding the rain showers, called Johnny Po Boys. Again, a non-discript little place, but what a great breakfast we had! Phil says it has the best biscuits that he has ever had, and he's an expert on that subject! The French Market is a fun place to shop and bring home all those souvinirs for the family, not to mention the pecan pralines, many of which we sampled! Lucily the French Market is covered (or at least it is for the most part) since we were dogding rain showers most of the day. You'll find a great assortment of cajun spices and cookbooks to take home and check out your culniary abilities!